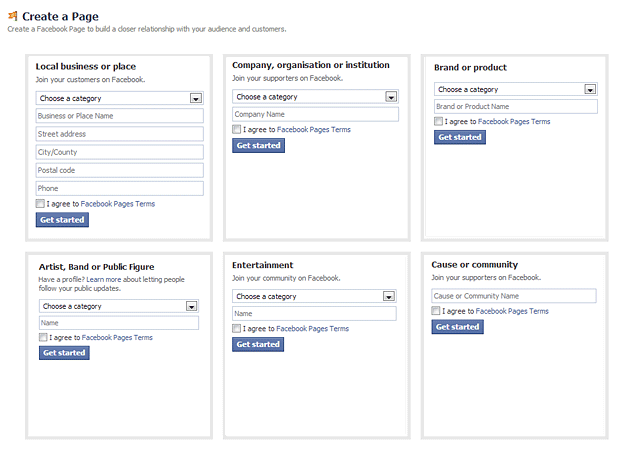 You need a Facebook account before being able to set up a business page (also called a Fan Page). You are permitted by Facebook to have multiple unrelated separate business pages, but they must be created and managed from a real person's account. 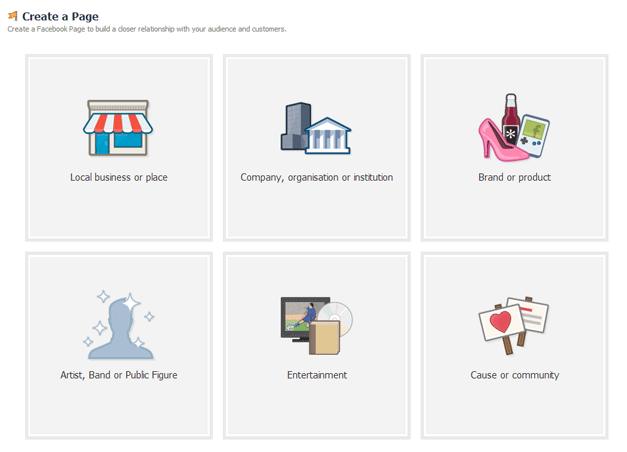 Facebook require you have an account with them BEFORE you can create and manage a Business Page or Fan Page. You cannot simply set up a Facebook account and change the Firstname and Surname to the name of your Business.If you do they will simply delete your page at some point. If you dont want the hassle of reading all the instructions, making the classification and category decisions and doing all the graphics work - call us and we will do it for you for £149 - call 01599 534964 now! CLASSIFICATIONS: Local Business, Company or Brand? You now need to Choose a general Classification - there are six to choose from. The classifications :- Artist & Band - Entertainment - Cause or Community are all pretty well self-explanatory however its perhaps less obvious which one of the remaining three pertain to your business. Its all about what information you can supply to Facebook and how they prioritise it. Users click the icon to reveal what basic data they are allowed to enter. These are the database "fields" on which Facebook will be able to order and classify your business. However the story does not end here as there are further "fields" you cannot see unless you follow through with this registration process (after clicking the blue Get Started button). For example:- The Company Organization Institution classification subsequently allows data entry for Mission, Description, Products Awards - you don't see these options until you agree to terms and click the blue "Get Started" button. Here is each classification's best use, what you are allowed to enter and NOT allowed to enter for each one..
Local Business or Place : For smaller businesses with a physical shop in one specific location and has opening hours. Company Organization or Institution : For when customers don't usually visit your offices or events are in different locations. Bing Map :- Both the above allow for a location map and this map is based on the physical address fields. It can be turned off if required - useful if the map displays the wrong location. Entertainment is great for TV, Books, Concerts or Sporting Events as they are time sensitive and allow for a Release Date field. Facebook Places : Local Business or Place automatically adds your page to Facebook Places. With Company Organization or Institution you do this manually after set-up. Choosing the correct category is an art - the choice may be simple i.e. you own a restaurant on the high street. But what if you simply cant decide e.g. if your business is half one category and half another? The Local Businesses > Professional Services choice may be for you. It offers most and denies the least to those who cant make up their mind. Choosing a category is permanent and the options cant be undone, however you CAN appeal to Facebook if you find that its impossible to delete the page and start again. They will then REVIEW the errant page and RE-CATEGORISE it at their discretion. This is not considered to be an automatic service; more of a courtesy to businesses who have exhausted all other possible remedies. Above is shown the various INITIAL fields with which you are presented after choosing one of the six categories. All six are shown, however in reality you would only see the one you initially selected. Beyond this point there is no return - so be careful what you type. You can however delete your page and start again. Assuming you have chosen the correct type of business and category, actually creating the Facebook Fan Page or Business Page is just now a case of filling in your details. As with most Facebook sign-ups its VERY straightforward. The ABOUT information should be detailed and succinct - it appears at the top of your business page (front and centred). You should now be at the stage of BRANDING your page and making it look like more like your business and less like Facebook. This involves uploading images. This is the larger "banner" sized image and is optimally 851 x 315 pixels. Its tempting to show a single lovely view, but remember people are here to see what you have to sell. If you only sell ONE item then fine, show it on the Cover Photo. You may wish to show other products or up-sells on the photo, this generating interest in other items you sell or services you provide. This is other "pages" you may wish to create. The Tabs themselves are 111 x 74 pixels. You are permitted as many tabs as you like (i.e. pages), however only four show on the page at any given time. To see more the visitor needs to click the arrow > with the number in it. Be sure to update the Milestones in your company - when was it founded, when was it 10 years old 100 years old etc. When was a new Managing Director chosen etc. This is engaging information. Use the STAR - This is the Featured Image marker. A featured image stretches right across both sides of the Timeline. This is a great way to announce things or mark an important event in the company. You can then have a business page like facebook.com/cocacola which is easy to remember instead of the one you get from Facebook with huge numbers and symbols. You must have 25 fans before you become eligible. You get this here > facebook.com/username Many good URL names are gone - plenty are left just think creatively. Once you page has a framework it needs REGULAR content. You can log in to Facebook and click Pages or simply use the Vanity Name to get there. You can add content from your computer however its even easier from a phone You can "post" images from your camera phone and add a simple description - job done. you just need the app. Use this feature once you are ready for people to see your creation. If your page is not ready; be patient and wait till you have finished tweaking the page and making it look as good as you possible can before inviting friends to view. The go to the ADMIN section and choose Build Audience. You can invite Facebook members to help administrate and add content to your Business Page. Just make sure that you don't give them too much power or they will be able to REMOVE YOU as the admin of the page. You may be startled to know what effort is required for thousands of "likes". A colleague initimated to me that he was posting 5 times a day to get to 4000 likes and the next "plateau" was 20 times a day to get to 20,000 likes. Engage visitors by saying "add caption for this pic" or "what do you think of this?" Use a Gateway, Reveal or Like-Gate page on your Fan Page. A bit old school but can still force a few likes. Run a feature (or competition) where people can upload PHOTOS on YOUR Facebook page. This way you get their FRIENDS to see the photos on YOUR page,,, and of course any other propositions there. Use the @ symbol in posts (activate this in Use Facebook As "Jim" )- This makes the posts personal and allows tagging of names. Like Swapping Software. Ethical ? Probably not and remember Facebook will delete your account if you contravene their Terms. If you dont want the hassle of reading all the instructions, making the category decisions and doing all the graphics work - call us and we will do it for you for £149 - call 01599 534964 now! This is (currently) separate* from a Facebook Page and is designed for mobile users th "check in"
Advantage : The listing comes before PAGES in the results. Aimed at mobile users. Its Geocentric. Disadvantage : Not updateable - limited info. When you "friend" someone on Facebook, you get to see their timeline. You cannot "friend" a business page but you can LIKE it. Its basically the same thing and tells Facebook to what degree Facebook members "like" your Business Webpage. The higher the likes, the higher it will tend to come in searches. SORT - Use this to flip betweenthe Most Recent and Top Stories orering. Internet Explorer shows the Footer Menu on Facebook; Google Chrome needs to scroll to the bottom of timeline. Highlight - Use the STAR icon to make a Picture or Story spread across 2 columns in Timeline.